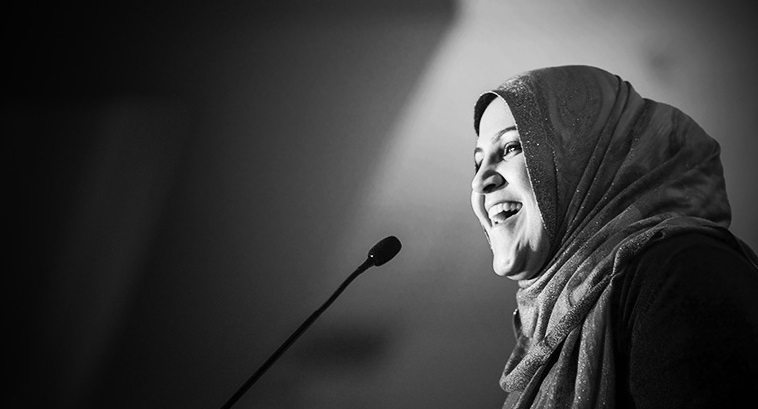 An activist in the Muslim community for nearly two decades, Hosai Mojaddidi has brought her unique contributions to numerous non-profit organizations, in addition to lecturing and teaching in Southern California. She is the co-founder of MentalHealth4Muslims, an organization devoted to mental health support. In this interview with Yomna Zaki of Al-Madina, she shared her thoughts on her work and mental health in the community. Al-Madina: For nearly 20 years, you’ve been actively involved in the Muslim community in the San Francisco Bay Area and Southern California, working and volunteering for many organizations. What inspires you to be as active as you are? Hosai Mojaddidi: I firmly believe, as my teachers have taught me over the years, that the greatest show of gratitude to God for the blessings He has bestowed upon us is to perpetually give back or “pay it forward” in one way or another. So I try to contribute as often as I can using whatever talents and abilities I have. Additionally, when I’m not staying active or involved with something for the community, I feel anxious and guilty and I try to avoid that feeling as much as I can! Much of your experience working in Muslim organizations has centered around education and the traditional Islamic sciences. How then did you develop an interest in mental health? All my life I feel like I’ve been drawn to (or vice versa) those who were hurting or in need of compassion and care. I have clear memories of my friends in middle and high school always coming to me with their problems and leaning on me. I now understand that there is a special term for people like me: empaths. This quality, being an empath, is what I believe eventually led me to a path towards mental health. When I was in my 20s I was very active with the Zaytuna Institute (now called Zaytuna College) and began leading halaqas for sisters. As I developed close relationships with many of the sisters there, they began to confide in me with their interpersonal and relationship problems. Many of them were newly married and dealing with the growing pangs of their relationships, some of them were victims of abuse/divorce, while others were dealing with guilt and remorse over past sins. They began to request meeting with me individually to discuss their problems. Soon word got around that I was “counseling” sisters and eventually couples also began to approach me as well. Even though I was always very clear about my lack of counseling credentials, the stigma attached with counseling and therapy along with financial strains made them reluctant to seek out professional help. So, out of care as well as obligation, I did my best to help them through. In 2010, my cousin, Dr. Nafisa Sekandari, who is a clinical psychologist then asked me to collaborate with her in the hopes of making inroads into the Muslim community in order to slowly break down the stigmas and stereotypes surrounding mental health. So, we started our website MH4M (www.mentalhealth4muslims.com) and began collaborating on articles and presentations that fused western/clinical psychology with Islamic psychology/spirituality. It’s common to find resources about the Islamic tradition by Muslim scholars, and it’s common to find resources about modern psychology by psychologists in the field. However, it’s not as common to find someone integrating both traditional Islam and modern psychology. Mental health has often been ignored in our community. Is this a recent phenomenon or something that stems from the tradition? What do you think are the reasons for this indifference towards mental health? I believe, until recently, the dominant view in the Muslim world, has been that mental health issues are synonymous with spiritual issues. This gross oversimplification is the result of centuries of misinformation and confusion about the characteristics of true, medically provable, mental health issues, as well as a deliberate suppression of alternate opinions by those who refused to give credence to science. Some in our community say or imply that if you are truly spiritual and have enough faith, you won’t be suffering from mental illness. What are your thoughts on this? Our own Beloved Prophet ﷺ would make daily prayers asking God for protection against depression and anxiety, two very common mental health issues that many people suffer from. Why would he feel the need to make such a prayer being that his deen was complete and he is the quintessence of Islamic spirituality? How do you choose which topics to address? And what do you think are the most important and pressing psychological issues facing the Muslim community today? I believe the most effective speaker is the one who listens attentively before she/he speaks. I like to gauge the pulse of the community by inquiring from friends and family about their concerns, following the works of activists/scholars who are working in the frontlines via social media, and keeping myself abreast of what the needs/concerns are of different groups in the community from the youth, to working/young couples, to singles, to older generations, etc. Religious leaders are often thrust into providing counseling when some may not be informed or trained sufficiently in this, especially when it pertains to mental health. How should our community address this? I believe everyone should “stay in their lane.” Just as mental health professionals should not be distributing religious edicts neither should imams and scholars (mis)diagnose those who are in need of proper counseling. The easiest way to address this is for Islamic centers and masajids nationwide to implement programs that offer mental health/counseling services through their facilities. Alhamdulillah many such programs are already in place and the trend is growing. We tend to have disdain or embarrassment towards those afflicted with mental illness rather than rahma (merciful love). What are the steps we need to take to remove the stigma of mental health in our community? Education. Education. Education! And of course conversation! The more we educate people, the more we talk to people, the more we can break down the barriers and stigmas. We need to be tactful and tactical when doing this. We need to address sensitive topics with care and create safe spaces for people to even get them through the door! I think collaborative efforts are always helpful. When you have religious scholars working with mental health professionals and sharing the stage it gives the latter instant credibility and will hopefully inspire attendees to listen carefully and learn. In some of your lectures, you talk about different personality temperaments. Why do you think this is important for us to be aware of? In your Twitter bio, you mention that you are a “wife, mother, activist, writer, blogger, editor, lecturer, and home-maker”. How do you manage to juggle between these roles? What advice would you give for those of us trying to be more productive and successful in different facets of our lives? I believe we all must wear different hats, it’s a reality of life. We just have to learn to prioritize which hats to wear first, which hats to wear occasionally, and which hats to never remove! As Muslims we know that we are held accountable for how we use our time. So my advice would be to make sure whatever we’re involved in is truly the best use of our time. My family has always and will always come first. I try my best to plan all of my other activities and involvements around their needs. Evenings and nights are usually when I get most of my “work” done. I also think it’s very important to do things genuinely and with heart. In other words, never do things out of obligation or resentment, even if you think you’re “helping” someone or a good cause. We sometimes fall into feeling guilty when we can’t do something or don’t want to. It’s better to do things with a good feeling and sincere desire to please God.